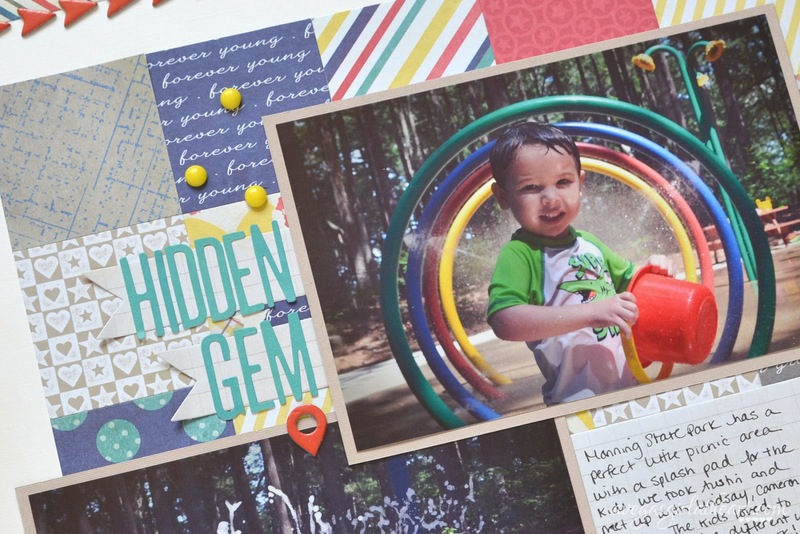 Today I'm sharing a traditional 12x12 layout that I created using mostly the Project Life Azure Edition. I love the colors in the Azure Edition, and they went perfectly with my photos from the splash park we visited last weekend. Since I'm not doing a lot of traditional pocket pages with the Project Life kits I have in my stash, I thought it would be fun to use them on a page. The inspiration from this page came from a sketch/layout that I found in Paper Crafts & Scrapbooking Simple Patterns for Paper Crafting and Scrapbooking magazine, page 82 if any of you have it. I changed up the layout quite a bit but the basic idea of a grid of patterns behind the photos is the same. I cut 2x2 squares from a bunch of the Project Life Azure filler cards and laid them out on my page until I was satisfied with the grid, then I attached them to the background card stock (which was sponged on the edges with Memento Desert Sand, to have it match the Azure cards a little better). At the top right of the layout, I added a subtitle, and I cut one of Azure cards and slid it under my photo. My main title (Jillibean Soup Alphabeans), I added on top of two banners I die cut from another one of the Azure cards. I curled the ends of the banner up a little just to give the page a little dimension. 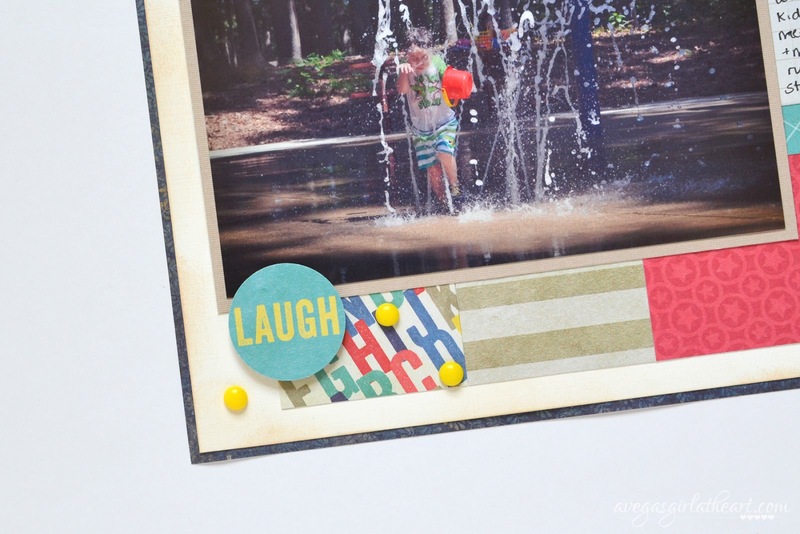 In the top left, I added a strip cut from one of the cards, and a half circle punched and stamped with the date. Then I used up some of these chipboard arrows I had in my stash from, I believe, Studio Calico. 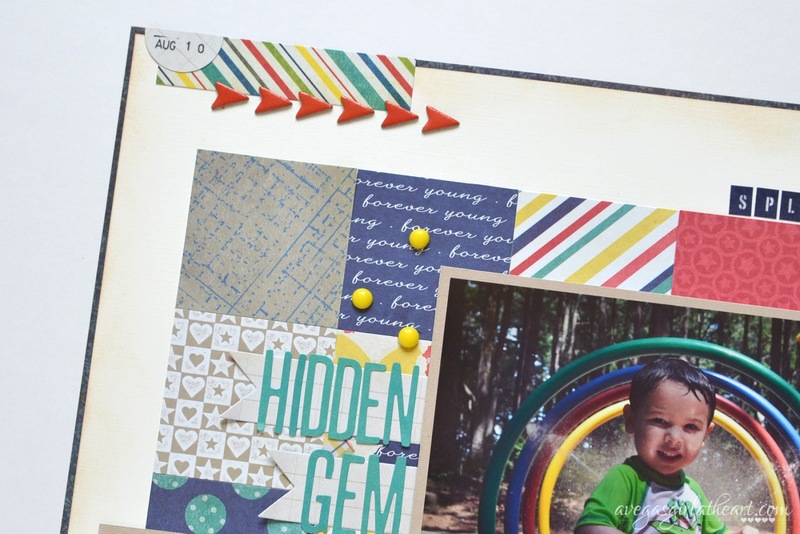 I scattered homemade enamel dots throughout the page. Finally, the bottom corner simply got a punched circle from another Azure card, popped up with foam dots, and then more of the homemade enamel dots. This is one of my favorite layouts so far. I had fun working with Project Life cards in a new way, and I enjoyed all the detail that went into this page.